The Darke County Friends of the Shelter will host a 5K at 9 a.m. April 20 at the Darke County Fairgrounds. 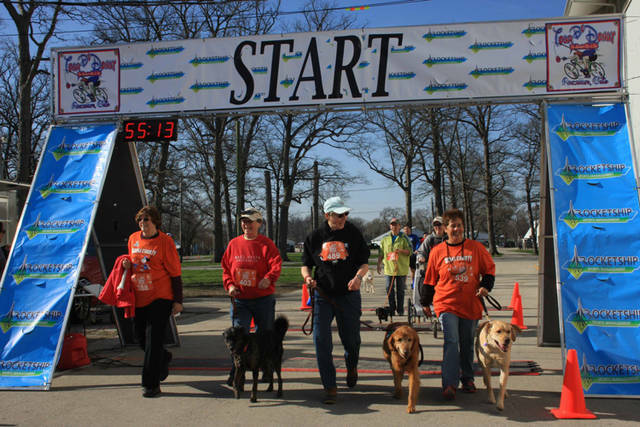 GREENVILLE – The Darke County Friends of the Shelter are sponsoring their annual 5KRun/Walk for Scentral Park dog park beginning at 9 a.m. April 20 at the Darke County Fairgrounds. This race encourages runners and walkers to bring their dogs as participants along with them. Those who don’t have a dog can still enter. Medals will be awarded to those racing with dogs as well as those racing without. A free kids fun run will be at 8:30 a.m. Free online registration can be found at www.gtraces.com. Same day registration begins at 7:30 a.m. at the Fairgrounds. All of the proceeds from this race go toward the maintenance of and improvements to Scentral Park Dog Park located at 5066 County Home Road, Greenville, next to the Animal Shelter. The Friends of the Shelter opened Scentral Park, Darke County’s only dog park, in March 2013, having raised the necessary funds from donations, grants and fundraisers. No taxpayer money was used. Scentral Park is maintained and improved through the monies raised by this 5K race. For more information, contact scentralpark5k@gmail.com. Race information also is available inside the Darke County Animal Shelter and at www.facebook.com/shelterfriends5krace.